According to its most recent state health inspection in February, the Red Hen restaurant had zero violations. President Donald Trump on Monday slammed the central Virginia restaurant that booted his press secretary over the weekend as an establishment with "filthy canopies, doors and windows" and suggested it was also "dirty on the inside." 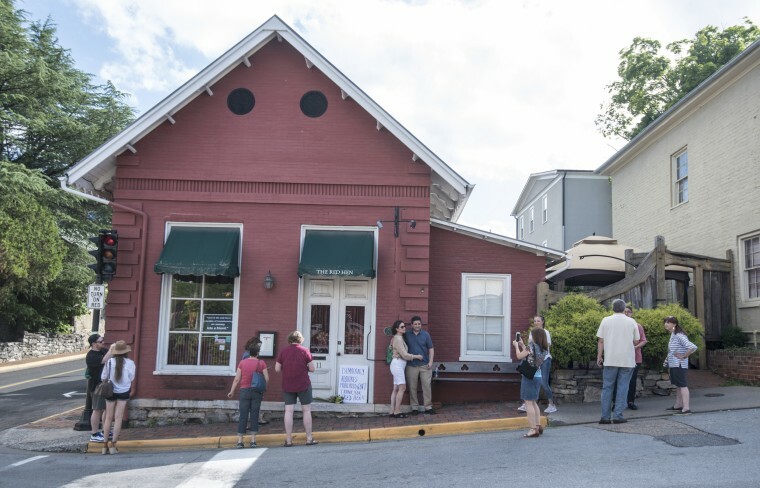 "The Red Hen Restaurant should focus more on cleaning its filthy canopies, doors and windows (badly needs a paint job) rather than refusing to serve a fine person like Sarah Huckabee Sanders," Trump tweeted Monday morning. "I always had a rule, if a restaurant is dirty on the outside, it is dirty on the inside!" he added. On Monday, in the wake of the Sanders incident, Rep. Maxine Waters, D-Calif., came under fire for saying that members of the Trump administration should be heckled when out in public. "If you see anybody from that Cabinet in a restaurant, in a department store, at a gasoline station, you get out and you create a crowd and you push back on them, and you tell them they're not welcome anymore, anywhere," Waters, who has called for President Donald Trump to be impeached, told supporters over the weekend. Trump responded, calling Waters "extraordinarily low IQ" and saying that she was calling for harm to his supporters. It was unclear Monday whether Trump had ever visited the restaurant that booted Sanders — the Red Hen in Lexington, Virginia, which is 50 miles northeast of Roanoke near the Shenandoah Valley — or how he would have determined its level of cleanliness. Trump's tweet came after White House press secretary Sarah Huckabee Sanders said over the weekend that she had been asked to leave the restaurant because she worked in the Trump administration. She added that she "politely left" after the request. The restaurant's co-owner, Stephanie Wilkinson, later told The Washington Post that her staff had called her to report Sanders was at the restaurant on Saturday night. Wilkinson said several restaurant employees are gay and knew Sanders had defended Trump's desire to bar transgender people from the military. A message left at the restaurant, which is closed on Monday, was not immediately returned. Sanders addressed the incident on Monday during a White House briefing in which she called for civility. "We are allowed to disagree but should be able to do so freely and without fear of harm and this goes for all people regardless of politics," Sanders said. "Healthy debate on ideas and political philosophy is important, but the calls for harassment and push for any Trump supporter to avoid the public is unacceptable. America is a great country and our ability to find solutions despite those disagreements is what makes us unique." Meanwhile, despite Trump's claims that the Red Hen is dirty, the restaurants has passed its inspections with minor or no violations. On Feb. 6, inspectors observed "good food/unit temperatures," staff with "clean uniforms/aprons," and an "excellent job on code-dating." No follow-up was required, according to the online report. The restaurant passed inspection in 2017 as well, although inspectors found one minor violation — "pickles/jams in a hermetically sealed container" that was "not from an approved food processing plant" — that was corrected during the inspection. The restaurant was not inspected in 2016 and passed in 2015 without any violations. In 2014, two violations were observed by inspectors but were corrected by the restaurant. Trump-owned and Trump-branded properties, however, have faced substantial problems discovered inspectors in recent years. Trump’s Mar-a-Lago resort was cited in January 2017 by Florida health inspectors with more than a dozen violations including issues regarding raw fish dishes that had "not undergone proper parasite destruction" and raw meats sitting in coolers that were not cold enough. Three of the violations were labeled high priority, meaning they could contribute to foodborne illness. The club, however, met the minimum standards to remain in operation. And in 2012, DJT, the steakhouse at the Trump International Hotel in Las Vegas, was forced to shut down briefly when inspectors found more than 50 violations, including ones regarding expired and mishandled food.